Recently we got a great question from one of our blog followers. They wanted to know which colors of Glide Thread were the most popular thread colors of 2018. 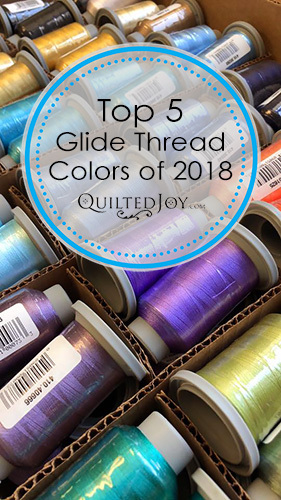 So, I went back through our records and found our Top Five Glide Thread colors over the last year. I consider myself to be a bit of a thread bimbo; I love machine quilting threads! After getting my APQS longarm quilting machine, I began to build up quite the thread collection. Some threads I liked and others not so much. But, the moment I was introduced to Glide thread, I was in love! Glide is a 40 weight trilobal polyester thread. Yes, a polyester thread and not a cotton thread! In my world, polyester is king because of its variety, durability, cost, and much more. When I opened up my shop I was agonizing over which colors I wanted to carry. There are more than 250 colors to choose from, and it was hard to narrow those down. Until my son said to me, “Well Momma, why don’t you just carry all the colors in every size?” And I thought, what a fabulous idea! So I have all 250+ colors to choose from and I can always find the perfect color for every quilt that walks through my door. Boring but ubiquitous, right? While I love stitching in Chartreuse, I don’t use that color as much as basic white. This color of Glide Thread is the perfect neutral and has a great sheen that looks lovely on your sewing projects. Thank you Quilted Joy for your fast and friendly service!! I love love Glide thread and its beautiful sheen. Karen McTavish got me started on that thread and so happy to buy it from you!! Beautiful thread...sews wonderfully in both my Viking Epic and my Qnique 15r longarm...fast shipping as always through Quilted Joy. Order the color card through them for a reasonable price and always know you are getting the right color for your project! Glide is the only thread that I use in my longarm! I use more white than any other color. It's awesome! You can’t go wrong with this thread... I use lots of this. The only thread I use in my long arm. As always the Quilted Joy team is exceptional. Even though I haven't had a chance to use the thread yet, I know it will be great. It came highly recommended by 2 fellow longarmers. In fact, I've gone on faith and ordered more colors. The card I received with my order was such a special touch. That makes it a pleasure to do business with you. I love love love this thread! I bought a few and will be getting more! Very fast shipping! I love Glide thread, and my machine is very happy with it, as well. This white has a beautiful sheen to it, which I really like! Quilted Joy is fantastic! Orders are shipped 2-day Priority Mail, which is great! Love the Glide Thread and bobbins. . I will always purchase my Glide thread from QJ due to their superior customer service. I also love the Marvy marker. It is the best marking pen I have found. I love this thread and the quick service that I get from Quilted Joy. I just ordred a cone of this thread and my 20-year-old grandson called me yesterday and asked me to teach him to sew today. He wanted to upscale a jacket. The lesson was great, he was excited and went home with an old sewing machine ad two spools of glide thread. It works so well with my machines. I love this thread. I love it for the ease and beauty of the stitch. I also think that the customer service here is awesome! I love this thread! It has a beautiful sheen and works great in my longarm machine.This will definitely be my go-to thread and I look forward to acquiring more colors! The perfect soft neutral thread. It blends without being showy. It’s a creamy ivory color that plays really well with a variety of cream, khaki, tan, and off white fabrics. I find myself reaching for this color of Glide thread when white feels too bright for the quilt. Another basic thread color every sewing studio needs. It disappears on the darkest fabrics and sews beautifully. How do you choose which color thread to use when your project has many different colors? In this case, this exquisite soft grey blends and recedes from the eye as it travels across a variety of colors. This color is a “must have” in my opinion. Who knew white came in so many colors! This one is bold and bright and unapologetic about it. Plus, it glows under black light too! Of course, that covers the basic neutrals but what about the actual colors? Well, I’ve hand selected a variety of Glide Thread Bundles so you can get a good variety and save a little money by purchasing the colors in a group. You can see the Angela Huffman Glide Thread Essentials and the Angela Huffman Glide Thread Favorites over on our Glide Thread Bundles page. The price is great and these are all very usable colors! I am very pleased! Angela sure chose some great favorites! These threads are beautiful. Glide thread is a great match with my new Lucey! This is an outstanding thread and the price is terrific compared to other threads I have purchase. Will definitely buy this again when this thread runs out. With 5000 meters each, it could take a while. What is your favorite color of Glide Thread? Let us know in the comments! I agree, Glide is my favorite thread. I like the way it looks and my Millie likes it so that makes me very happy. Silver is my go to thread color.